The Parrot Airborne Night Swat is one of Parrot's next-generation minidrones. Strong and impact-resistant, you can customise it in no time. One of its top features is its two LEDs! Turn on its headlamps to go high speed at any time and move into dark areas with lights blazing. With its black hull, sneak in unnoticed to make even the most extreme operations a success! Capture daytime aerial views with the built-in vertical mini-camera. The Airborne Night Swat is as light as a feather, with exceptional flight stability. How? Thanks to its gyroscope and 3-axis accelerometer. 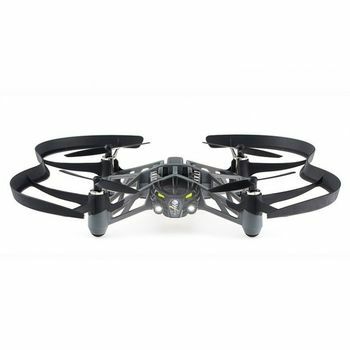 This ultra-sophisticated technology makes the Parrot Airborne Night Swat one of the most stable small quadcopters on the market. Perfect for looking back at your flying feats! 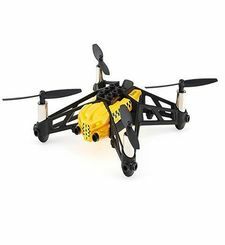 Our nifty drones are packed with all the fun in the world and additional interactive opportunities : they offer unlimited learning possibilities in STEM and coding! We partner with Tynker, the leading code-learning platform used by more than 50 million kids. We have also developed an activity book for the amazing Apple Swift Playground. Finally, we have created a platform to share all those learning resources. Now you can easily teach and learn coding and problem solving in a game-like fashion!